An average of 120 patients stayed in the clinic daily. In rainy season extra wooden beds should be put at the corridors to accommodate patients. The hospital wards are divided into medical, surgical, paediatrics and obstetrics and gynaecology wards. All the inpatients have their own attendants who either are their parents or children or close relatives. The clinic provides a cooking place, fire woods and water so that patient-attendants may cook the dishes of choice for their respective patients. Though these attendants come from very diverse ethic and religious background, they can practically share the cooking place! 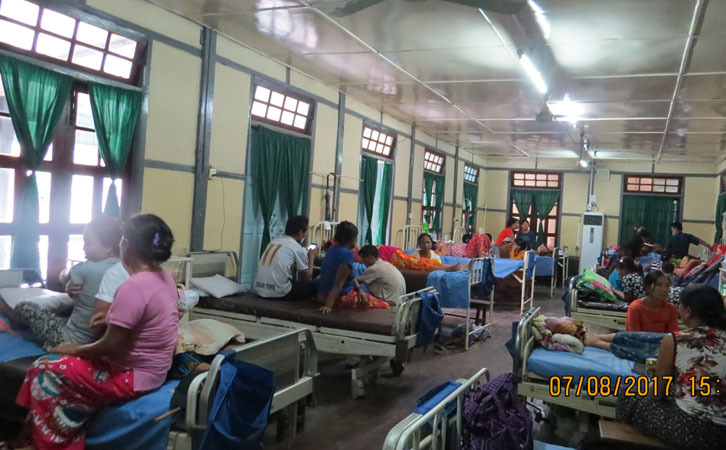 Each patient is charged kyats 1500 per night for hospital bed.